Continuing my stroll down 4th Street in Long Beach last Saturday for "Shop Local" day, I wandered into a store which both hipsters and collectors alike can agree is just about perfect. Inretrospect. What. A. Variety. O. M. G.
In honor of the busiest shopping weekend of the year, I headed over to Long Beach to support Small Business Saturday (an American Express 2010 invented holiday), and to check out the slew of vintage shops that I have heard were hiding out on Fourth Street. Trebor/Nevets was my first stop. Wow. I had so much fun with the San Diego Dwell Home Tour (you can see #1 here, #2 here, #3 here and #4 here) that I decided to hunt down all the people I know who have cool houses. First on the list is the Barrett's 1965 California-style ranch house. I came over on a very foggy evening. We are in the home stretch now with our fourth post on last Saturday's (Nov. 10, 2012) Dwell Home Tours Modern San Diego. I won't say that I have saved the best for last. They were all pretty special in their own ways (you can see #1 here, #2 here and #3 here). But the Harris Residence has something distinctly unique about it. 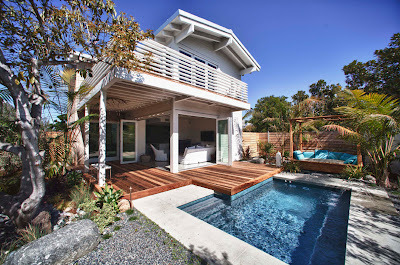 This week's Dwell Home Tours Modern San Diego post series: we're on the third gorgeous modern home with one more to go tomorrow (you can see #1 here and #2 here). Our third venue is the Modern Cardiff house. The home is incredibly distinguished looking with blackened exterior planks made from trees damaged in the Cedar Fire. Dwell Home Tours Modern San Diego continues! As an avid student of the modernist movement, I was in heaven in San Diego last Saturday afternoon (Nov. 10, 2012). 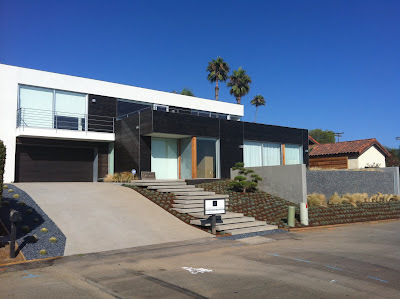 The second home on the tour was a modern beach inspired home with references to mid-century modern architects Richard Neutra, Cliff May, and William Wurster. This new construction of 2,200 square-feet by architect Brett Farrow, is another modern modest home which also packs quite a punch. I drove down to San Diego from Orange County (1.5 hours), this past Saturday (Nov. 10, 2012) for the Dwell Home Tours Modern San Diego event in anticipation of a modern with a capital "M" good time. I was not disappointed. Each of the five homes I toured Saturday was unique and spectacular in its own right. I was able to take photos of four of the interiors and will post them all week. 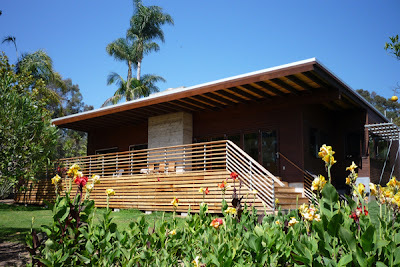 Without further ado, the first home toured was the Munson Residence, located on the Del Mar coast. This house is located near the lagoons and coastal bluffs and has some spectacular views from its rooftop deck. Dwell on Design San Diego Home Tours are happening this weekend Nov 10 & 11. As part of the event, all ticket holders are invited to the brand-new Dwell Design and Drive event, to test-drive a new Lincoln vehicle and help raise money for Architecture for Humanity. Architecture for Humanity's most recent cause is raising donations to restore the hard hit Seaside Heights, New Jersey area. You can donate directly to Hurricane Sandy rebuilding efforts on the Architecture for Humanity website. I have a special spot in the kitchen reserved for a mid-century atomic style clock. And, I have been looking at eBay listings for mid-century atomic clocks for a long time. I finally spotted the perfect clock. Before you can say "buy now," I entered a bid. This picture is from the actual listing. Don't you think the Indian on the wall is a nice touch? Family meals in our household growing up were a shared duty. My sister and I were both responsible for at least one meal a week night, as was our dad. My mom usually left a recipe out on the counter with a note, "For dinner." In case we didn't get it. My FAVORITE dinner to make used all of these readily available, fresh from your refrigerator ingredients. Who doesn't have a pack of Crescent rolls laying around?